Some really interesting posts today. 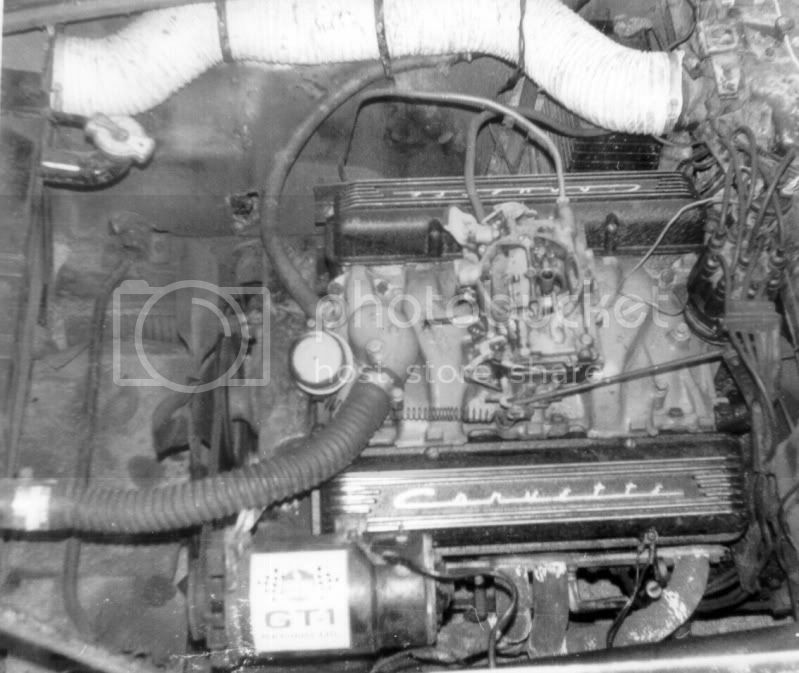 Both the Ghia Aigle and the fuel injection are very interesting. Thanks for posting. I don't think I posted this one yet. Car appears to be cover car on Feb 2010 issue of Corvette Enthusiast. Car has number of special features to include paint color, headlamps, and interior trim changes. Looks great to me, but I'm biased. My first Corvette. Picture taken sometime in 1971. Note: no front grille bar or license plate mount/bumperettes. 1963 wheel covers! This is BOB BONDURANT'S 1957 race Corvette. Not sure who the gal is, but Bob probably remembers. He had a habit of knowing 'all' the gals at the races. The car was originally raced by Jerry Austin here in Southern California. Today, Mick Sweezy owns and vintage races the car. One of the very rare 684 heavy duty brake, suspension cars made. Oh, and thanks to all f you who pointed out that my '60 had an incorrect paint job - I've since had the entire cove painted white! Great picture Jim. Did you notice that the silly hats are printed on her skirt also? Here's two I shot at the NCRS Flint national convention in 1978. Thanks! Aren't they all beautys? Happy motring and New Year!! 1957 and 1962 both F.I. 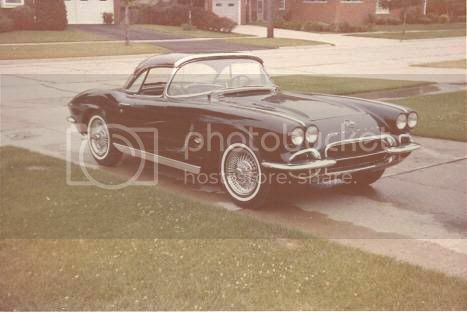 Here's a shot of my first Corvette a 59 which I bought back in 64. I sold it when Uncle Sam called me up in 65. The other pic isn't a C-1 but I think it's neat. The guy in the photo is a friend of my brothers who had a slight fender bender with his 65 back in 1966 or 67. This is a scan from the Newark News and shows him right after the hit saving his 8 track tapes. It looks good with the '64 wheel covers. Your brother's friend is lucky that he didn't store his 8 tracks behind the seats. 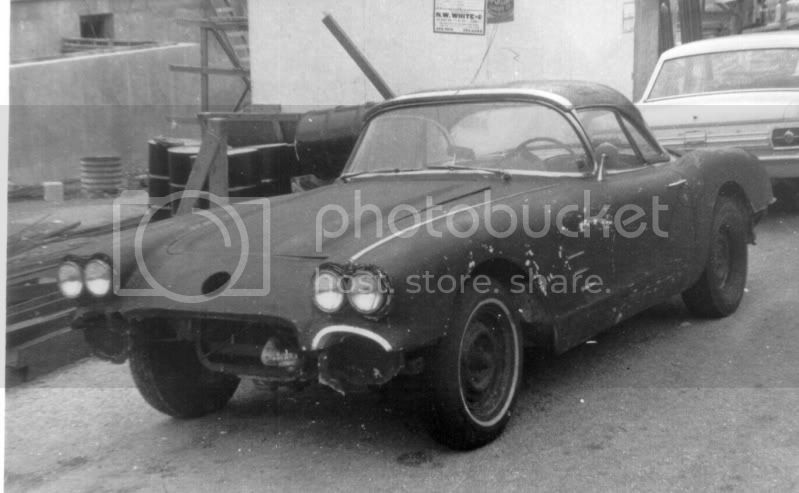 Here's a shot of my first Corvette a 59 which I bought back in 64. Ya gotta love the "office" and the Rat Fink shifter. Would you believe this POS would do the quarter in 13.9? (note how little superfluous fiberglass or chrome there was to slow it down). Yours doesn't look bad. Most of that will buff right out ! I remember when I bought mine the seller wanted $1,300.00, I offered $1,000.00 and a week later he called and accepted. 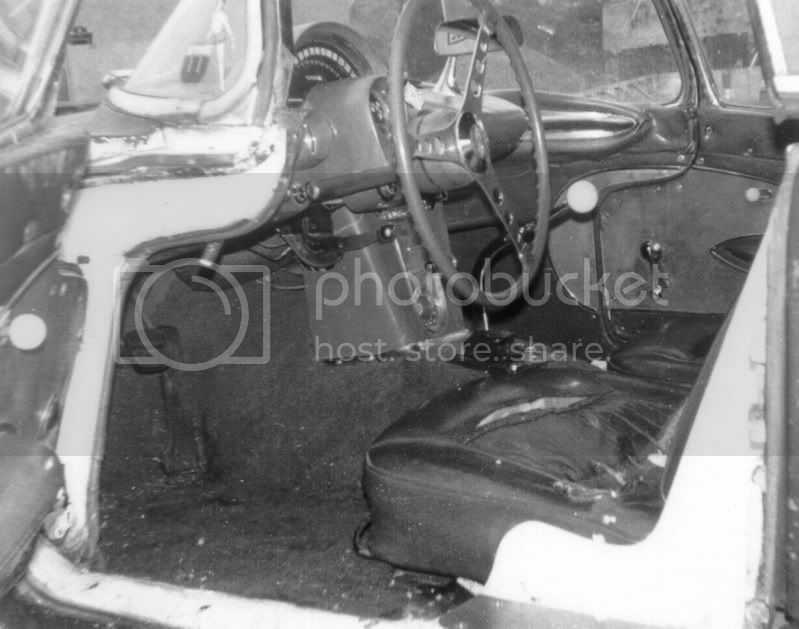 The car was pretty complete, 2 tops, 4 speed, 230 base motor but the interior looked like a grenade went off in it. I was eighteen and couldn't care less, I had a Vette. I sold it for $1,200.00 a year later when I went in the service and was sick untill I found my 62.